Well…I tried! I definitely didn’t get the chance to share all of the recipes that I was planning to post, but I’ll give myself credit for the two that made it up and that just means that I’ll try again next Ramadan, ان ساء الله. 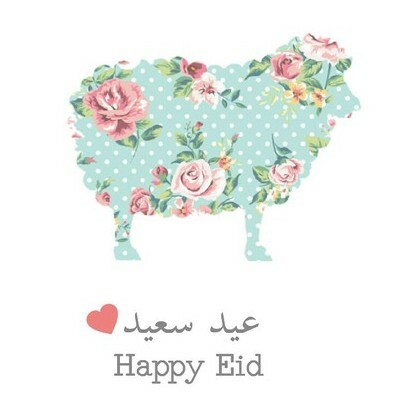 I hope that all of you had a blessed Ramadan and a wonderful Eid. This is very late, but better now than never! We spent our Eid in Ha’il with Y’s family. It was baby’s first Eid, so I really enjoyed getting her dressed up for our gatherings. The first day of Eid I put her in a grey pleated dress with teal embroidery, a teal bow headband and a pair of sandals from Okaidi. On the second day she wore a white eyelet dress from Carter’s [which I purchased online during a sale for less than $12], a bow headband we borrowed from her cousin and a pair of white shoes from Centrepoint. I forgot to take a picture of her outfit from the third day, but she had on this cute white and gold patterned tank bodysuit and white cotton pants from Carter’s. Also, one of Y’s uncles paid for the girls to stay at the rented Istrahah an extra day, so we had another evening of dressing up. Baby wore a little set with a black tank bodysuit (that said little cutie in gold) and white pants with a black and gold print from Carter’s [this set was a gift from my mom]. I had such a fun time putting her in such cute outfits, as to be quite honest 90% of time time she’s either in a play suit for bed or a onesie and maybe some cotton pants, maybe. Once again, please accept my warmest belated Eid wishes to you and your families. I love chat, text, email, forums and I love this blog. I think it is pretty amazing how we can share things with people near and far. However, the Internet can also be a cruel place. I place part of the blame on the anonymity that the Internet allows. People think that they can say whatever they like behind the mask of a username and profile picture. Since I started writing about my experiences in Saudi I have received numerous comments that made me think, what’s wrong with people? After I received my first *negative* comment I switched my settings to allow for moderated comments. That was a long while ago. Now anything that is submitted is reviewed and either accepted and made public or deleted. Just to clarify, when I say negative I don’t mean a comment with an opposing view. I am referring to comments that are meant to be hurtful. Also, let me mention that all but one of those comments that I have received were posted using a fake email. I am so tempted to actually share some of the awful words, استغفر الله, but I will refrain and just say may Allah guide us. Before you comment on someone’s blog, social media account, YouTube video or whatever else, remind yourself that the person you’re writing to is a HUMAN BEING and they have feelings just like you. If your comment is not constructive, and could possibly be viewed as hurtful, don’t send it! Keep it to yourself and go on with life. There is no benefit in spreading hate and hurting others. The other issue is the fact that I feel written word is not complete communication in that there is difficulty with tone and emotion. What we mean when we write something is often misinterpreted. In my own experience this happens very infrequently when speaking with someone face to face. As a shy person, and someone who likes to write, this can be super frustrating. It has happened to me more than once and I really hope that it becomes a less frequent occurrence in my life. Ive been writing here on this blog since 2013 and I feel really grateful that I have been able to share my experiences (even though my posts became less and less frequent over time). While sometimes I feel like it is not worth it to share parts of my life this publicly, I remember that with every hateful comment I receive a lot more lovely ones. So, for now, I will keep sharing some beautiful and POSITIVE aspects of my life, as a Muslim, a wife, an educator and a new mom. First of all, I’m so sorry that I’ve been gone all these days without any sort of update. I had a little break from work for Hajj and Eid. On the first of the month I traveled to Turkey where I spent time in Istanbul and also Bodrum. I plan to make quite a few posts about my trip ان شاء الله, so I won’t be saying too much about that now, but I will say that it was a really fantastic and relaxing holiday. I’ll be back real soon with lots of details about my trip, ان شاء الله. All week I have been receiving beautiful pictures of the rain in Ha’il from Y.
I have been looking forward to sharing them, but instead of listing them in this post I have put together a short video slideshow that goes along to an a capella song about the city. It has been a long time since I bought a book that wasn’t for school. Yesterday I went to the mall with two of my colleagues and we spotted an Islamic bookstore as we were going to enter the market. I ended up buying two books. 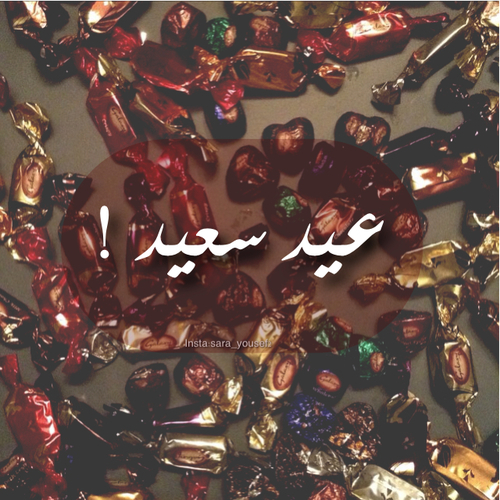 The first is called Don’t Be Sad. It is over 450 pages and the intro states: “Don’t be sad is an important book for all. It is full of practical advice on how to repel despair and replace it with a pragmatic and ultimately satisfying Islamic outlook on life. It exposes to the modern reader how Islam teaches us to deal with the tests and tribulations of this world. This book, the culmination of deep and organized thought, says to you in short: ‘Be happy, at peace, and joyful; and don’t be sad. '” I plan to share beautiful saying from this book as I read it. The second book is called The Sealed Nectar. 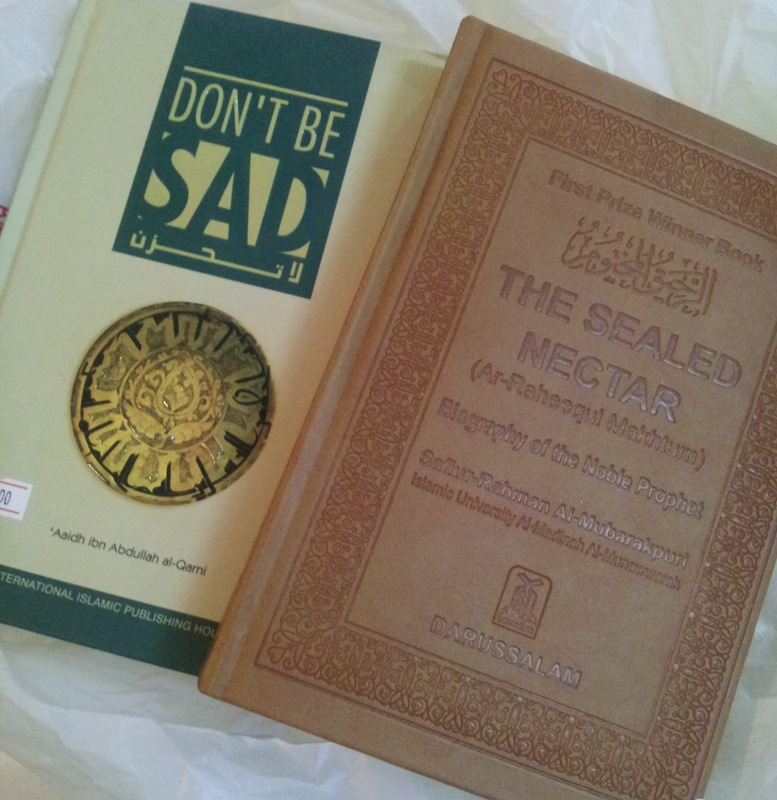 It is a biography of Prophet Muhammad. 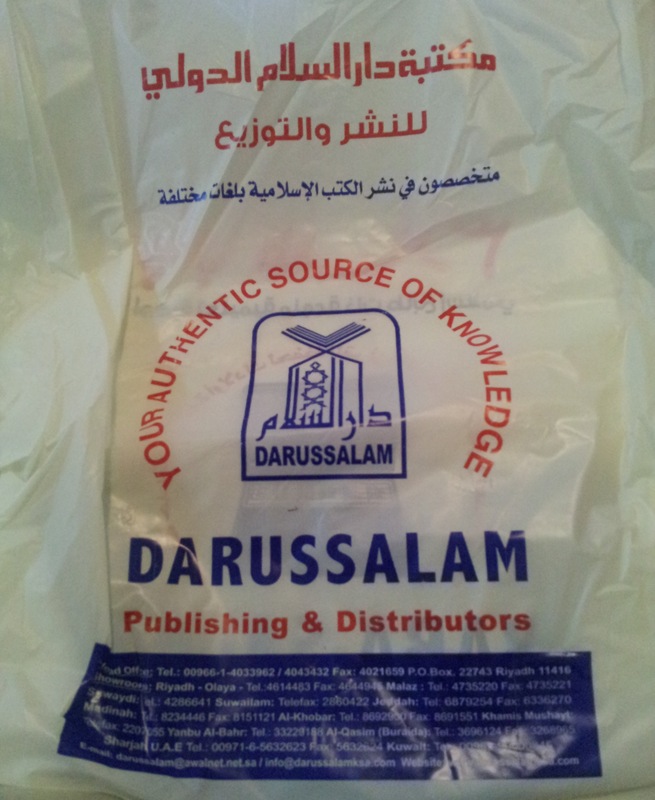 It is over 550 pages and I’m really looking forward to reading it and finishing it, in sha Allah. There was a bit of time when I was reading from my iPad, but I wasn’t doing it often and I think that was because it is simply not the same as opening a book. That moment of excitement followed by care as to not crack the spine too much. Turning pages and not realizing as they pass. Reading the last words of the last page and wishing it wasn’t the end. I’m really hoping that these two books will bring back the love for reading that I used to have. I had really forgotten how lovely it is to actually hold a book in your hands feeling its weight and to turn the pages while noticing their thickness. I’m ready to go back to the days of carrying a book in my bag to pass time instead of grabbing my cellphone in every empty moment. Friday morning we woke up and ordered coffee, tea, dates and a couple cheese sandwiches from the shop below the hotel. We enjoyed the food, talked and watched tv. Friday (Jumu’ah) in Islam is like Sunday in Christianity. There is a special prayer in congregation on Friday at the noon prayer. The athan will sound as usual, but there will be a sermon (khutbah) before the prayer. “Oh you who have believed, when the athan (call to prayer) is called for the prayer on the day of Jumu’ah (Friday), then proceed to the remembrance of Allah (God) and leave trade. That is better for you, if you only knew. And when the prayer has been concluded, disperse within the land and seek from the bounty of Allah (God), and remember Allah (God) often that you may succeed”. The prayer on Friday is half of what the noon prayer is on all the other days of the week, a beautiful gift from God. After the Friday prayer we packed up our things and left the hotel. We started driving around trying to decide what shops to stop at or what mall to visit. Most of the shops were still closed because of it being Friday. 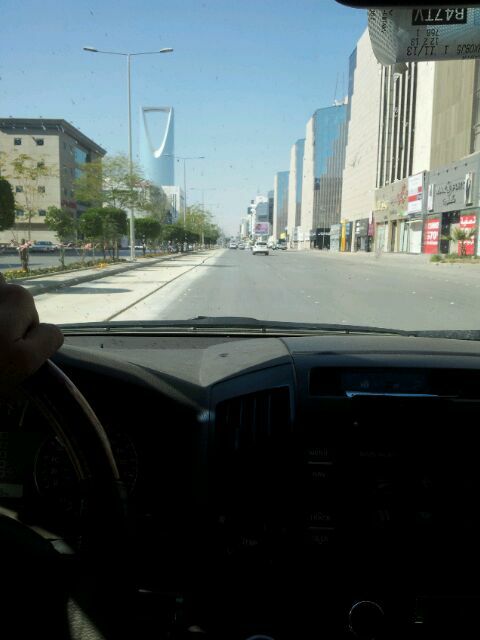 It is similar to how everything closes early on Sunday in the USA, except the shops here in KSA open later instead. 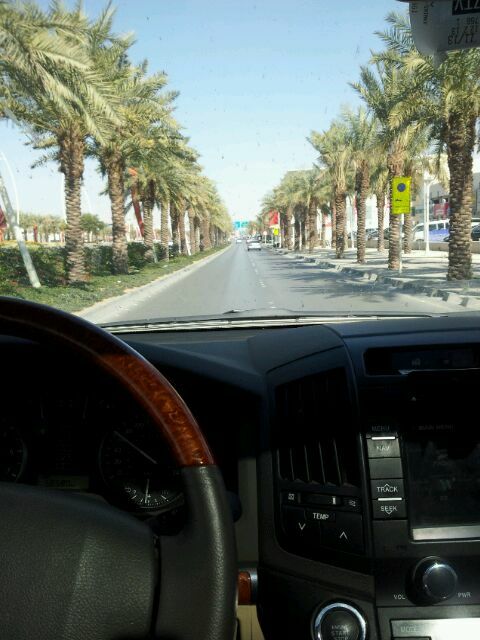 Eventually we decided to go to Riyadh Gallery – الرياض جاليري . 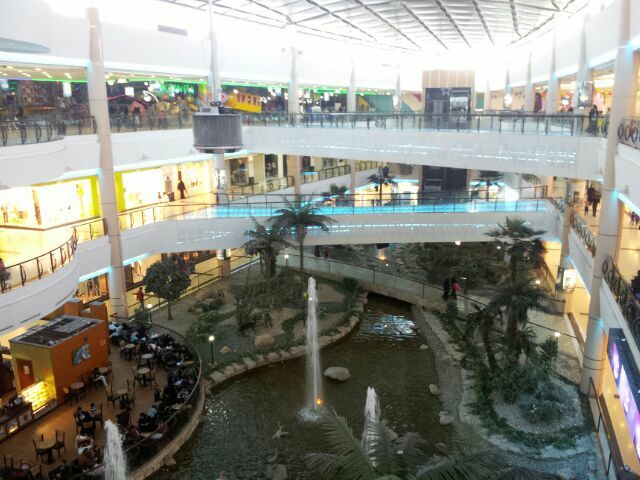 It is a three story mall with a beautiful, almost park like design in the middle of the ground floor. There are all kinds of shops, a supermarket and tons of restaurants. I really enjoyed walking around the mall with Y, Mom and H. We went in and out of various shops, sat to relax while the stores were closed for the afternoon prayer and eventually made our way back out to the car. It wasn’t my first time at the mall and even at this mall in particular, but the experience was different because of who I was with. I’m not sure how to explain, but just having them around me there made it a much more beautiful experience. Y’s mom would come to me with a skirt or a shirt that she thought I would like and there is something about that action that makes whatever item more important or more valuable. It is the same feeling that I get when I receive a gift from someone I love, no matter how small. These are things to cherish. Grocery shopping with Y reminded me of home. It was comforting to have him by my side, pushing the shopping cart and making suggestions of things I might need. It might seem silly, but these are small moments that bring warmth to my heart while he’s away.